Chen Guangcheng, a blind lawyer and one of China’s best known dissidents, has escaped from the house arrest. Rights activists say Chen Guangcheng slipped out of his home in Dongshigu town in Shandong province on Sunday. Chen Guangcheng’s exact whereabouts cannot be verified at the moment but human rights campaigners said they believe he has fled from Shandong province. He has been under house arrest since he was released from jail in 2010. Activist He Peirong, who has been campaigning for his freedom, told various sources that she drove him to “a safe place” outside Shandong. There are also unconfirmed rumors that Chen Guangcheng, who is blind, is at the US Embassy in Beijing. The US embassy ”would not comment”, says an Associated Press news report. In the same report, He Peirong denied the rumors published in Singapore’s Lianhe Zaobao newspaper, saying that she had spoken to people at the embassy. “I can tell you he’s not at the US embassy, and he’s not in Shandong,” she told AP. An activist based in the US who has been in close contact with Chen Guangcheng confirmed that the dissident had left Shandong. ”He was able to get out of his home on 22 April and his friends… escorted him to a safe location outside of [his home province of] Shandong,” Bob Fu told the AFP news agency. 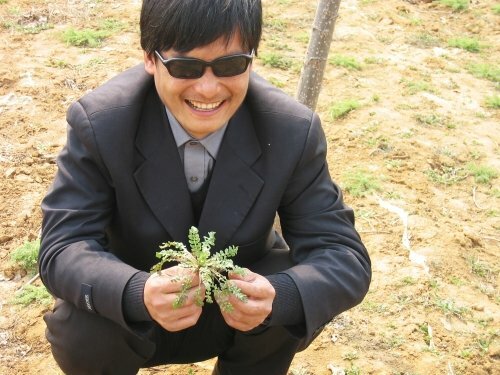 Chen Guangcheng, who has been under house arrest for almost 20 months, is known as ”the blind lawyer”. He lost his sight in childhood. He has no formal legal training as the blind were not permitted to attend college. He is known for revealing rights abuses under China’s one-child policy and has accused officials in Shandong province of forcing 7,000 women into abortions or sterilisations. Chen Guangcheng has also advised farmers in land disputes and campaigned for improved treatment of the disabled. The plight of Chen Guangcheng has become famous around the world, and the US Secretary of State Hillary Clinton has repeatedly called for his release and is due to visit Beijing next week.